Nicole's Needlework: I love this thing! 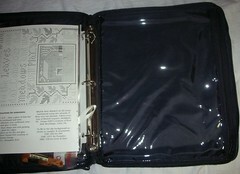 Outside of Organizer (nice, big pocket). 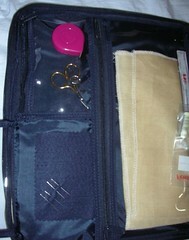 Close up of left side - has a felt needle holder and two zippered pockets. Close up of right side - a big zippered pocket. And the project it's holding - Prairie Schooler Autumn Leaves. I'm so excited... dh and I may be getting away next weekend. It won't be a total getaway because we may be taking the baby (not sure if I'm ready to be away from him yet). But it will still be so nice to just go somewhere. We'll see what happens. I'm thinking of either Dunedin near the Gulf or Palm Harbor near Tarpon Lake. They both have pretty reasonable rates with beautiful views. I still need to discuss it more with dh about the baby, etc. But no matter what we decide I can't wait! :) Write later! You're so organized!!!! Hope you and DH (and Baby too!) get a weekend away soon. Enjoy Autumn Leaves - I sure liked stitching that one. Love the organizer. I may need to check them out. It's nice to be organized. Autumn Leaves is look great so far. 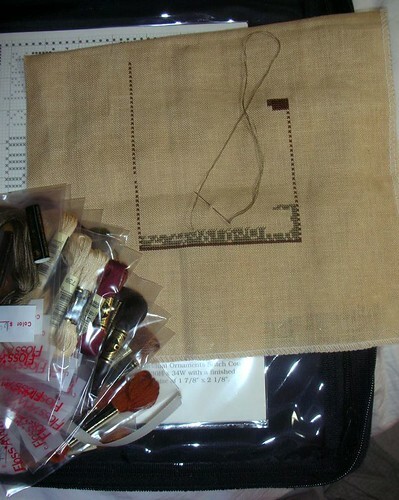 I switched to the entire stitchbow system and have the bag too. I love it!! 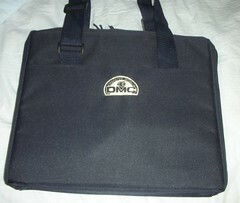 I saw AC Moore had the new messenger bag style the other day. A couple came in today, so I just might have to go get one of those. 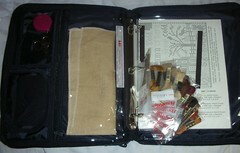 That does look like a nice bag for storing projects! Enjoy your getaway this weekend. Congrats too on the Pear Tree Inn finish - it looks great! Great organizer! And I love the fabric you are using for PS Autumn Leaves, it looks perfect. Hey this is good to know as I am always looking for things to spend my coupons on and I have several gift certs to use too. Have a great time on your weekend getaway. I need to get Autumn Leaves - my LNS was out of it darn it! Yea, doesn't it feel soo nice to be organized. I'm stitching on Autumn Leaves right now, too! I love everything about it.